Timbren Hollow Rubber Springs are mounted between the frame and the axle of light duty trucks and vans or between the frame and the leaf springs of medium and heavy duty trucks. Hollow rubber springs work in conjunction with the existing suspension to improve your ride and protect against the effects of overloading. 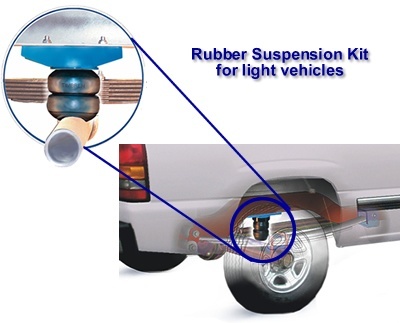 Our rubber suspension kits can be used on a variety of vehicles, such as: heavy, medium & light goods vehicles; pick-up trucks; vans; caravans; boat trailers and general trailers. All Timbren products are manufactured to ISO 9001 quality standards. Hollow rubber springs work in conjunction with the existing suspension to improve your ride and to protect the vehicle against the effects of overloading.